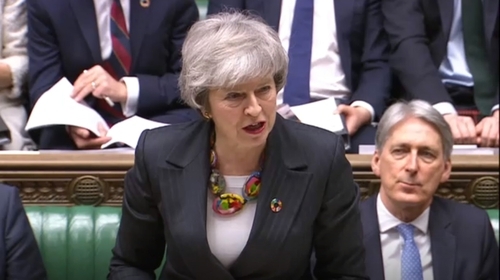 The FINANCIAL -- MPs are to debate and vote on the next steps in the Brexit process later, as Theresa May continues to try to get a deal through Parliament. A series of amendments - designed to change the direction of Brexit - will be considered in the debate, which is expected to be a routine procedure. No 10 insists Mrs May still plans to hold a vote on a deal as soon as possible but Labour has accused her of "running down the clock" in an effort to "blackmail" MPs into backing her deal. However, influential Brexiteers from the European Research Group of Tory backbenchers are angry at being asked to support the PM's motion. This is because it combines the view backed by a majority of MPs last month that the government should seek an alternative to the "backstop" with a separate move to stop Brexit happening without a formal deal. "We cannot vote for this as it is currently configured because it rules out no deal and removes our negotiating leverage in Brussels" - Mark Francois, The group's deputy chairman said. Most MPs want to avoid a no-deal scenario, fearing chaos at ports and disruption to business. But some Brexiteers have played down that prospect, arguing it is an example of "Project Fear". MPs rejected the deal negotiated with the EU by a historic margin in January and the prime minister says she is seeking legally-binding changes to the controversial "backstop" - the "insurance policy" aimed at avoiding a return to border checks between Northern Ireland and the Irish Republic. Meanwhile, 43 former British ambassadors and high commissioners have called on the prime minister to extend this deadline. In a joint letter published on Thursday, they argue the UK should not leave the EU without more clarity about the future relationship bloc, adding that the current "Brexit fiasco" makes a "powerful argument" for another referendum.